Chris Shaw was drafted in the first round (31st overall) by the San Francisco Giants in 2015. Since then he has risen through through the ranks from San Jose and Richmond to Sacramento. 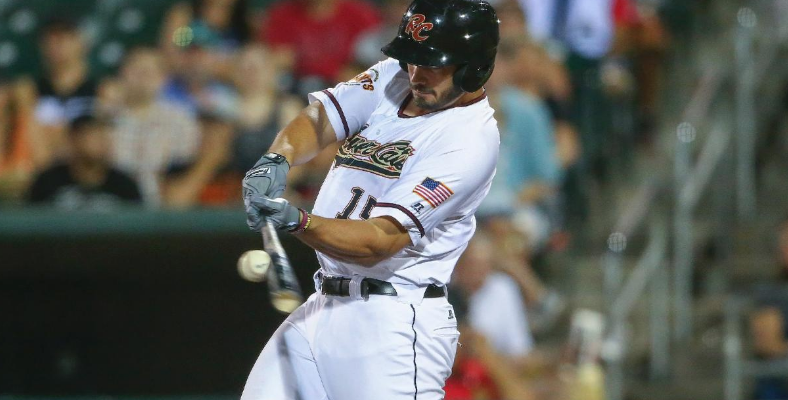 Last year Shaw hit 16 homers and drove in 44 runs in only 58 games for the Rivercasts of Sacramento. He is one of the Giants top prospects and sought after by many other Major League teams in potential deals. Originally a first baseman, Shaw was moved to left field to quicken his ascent through the Giants system in the hopes of earning a spot with the Big Club. Check out that bat flip! Together We’re Giants: Congratulations on the walk-off home run last night. Chris Shaw: Thanks. That was the epitome of happiness on a baseball field. There is nothing quite like hitting the game winning shot and celebrating with your teammates and having it be the final blow to win a ballgame. TWG: What coaches were inspiration to you in your career? CS: I had a high school coach (Lexington High School in Lexington, Massachusetts), named Tom O’Grady who was old-school and really strict. He was a major influence on me. He instilled in me an ethic of hard work and preparation, of learning principles of doing things the right way. I will tell you a story about him. I had a practice freshman year and he had bought me a first baseman’s mitt before the year because I did not have one. I showed up for practice one day and I did not have it with me. I was using a normal glove for my grounders at first base when I should have been using the mitt. When he saw that he had me run laps for one hour and a half. I never forgot the first baseman’s mitt again. I feel there is not enough discipline and tough love today in general and in baseball in particular. The coaches are too soft today. They are afraid to demonstrate a more intense way of coaching and providing discipline. Tough love shapes you as a person and a ballplayer. TWG: What has been the biggest adjustment for you moving from A to AA to AAA baseball? CS: The predictabiliity of pitchers has changed. They get less and less predictable in the higher leagues. In lower levels pitchers are just trying to hone in on fastball command. Against them I can lock into one zone, expect a fastball and launch my swing in one area in the Cal League. When I faced a right-handed pitcher I knew he would throw me fastballs away. As a good hitter you can stick to a plan. In AA its similar. It’s a mostly fastball command league but the stuff is way better. As for the comparison between AA and AAA raw stuff may be better in AA than AAA. In AAA it pitchers are so unpredictable. A guy who throws 100 mph may only throw one heater per at-bat. As we play Fresno in this series (at press time) it appears the Astros have an organizational philosopy to never give in and walk guys rather than risk damage to a hitter. This means you rarely get fastballs when you are ahead in the count. They don’t want guys to put a good swing on it. We have charts that show slugging perentage and hot zones and they do too. They use that info a lot and we have to learn it. I am starting to see a different side to the game. It’s interesting that both teams have the same info so I have to come with a counter plan to figure out how they will go at me. In a perfect world they would pump fastballs at me low and in but I know that doesn’t happen. It’s more difficult today. It’s challenging and it keeps you on your toes. That’s just the way the game is at higher levels. TWG: What were your emotions when you realized you were drafted by the Giants in the first round and 31st overall in 2015? CS: It was the best day of my life. You play baseball your entire life and you dream about pursing a career in pro ball. To have my family and friends with me and hear the Giants drafted me was an incredible feeling and very difficult to describe. It was a culmination of my entire life’s work. It was really cool. TWG: What was the biggest adjustment you had to make from playing first base then moving to the outfield? CS: I think the biggest adjustment I had to make was difficult for me to put in words. At first you are so close to the action you are right here and it is a quick reactionary intense and focused position at first base. Your attention is focused but in the outfield it’s more of a free flowing feeling. When I play the outfield and the ball is hit off the bat its all about running. I know I have to have a good first step in the outfield. It is a smoother experience but at first base it s constant quickness ness and there is a difference in attention and intensity. I am more relaxed in the outfield. I feel more at home there. The two positions are also different in terms of how you take care of your body and how you train. In the outfield you can run a mile per game chasing balls. The requirements on your arm are also different. At first bast I have a lower arm slot. In the outfield your arm is an asset and you have to take care of it like a pitcher would, with more work, preparation, using bands and other exercises. TWG: It seems many other MLB teams are interested in acquiring you and were trying to pry you away from the Giants last season in trades. Were you aware of those rumors? How did it affect you and were you happy that the Giants never seriously considered trading you? CS: You know during a season you have to keep your focus on playing and on your performance. I tried to focus on the game, on the field and concentrate on what I can control. It’s not fair to me or my teammates to get distracted. The only thing we know is what’s going on right now. I don’t want to be a guy that gets stressed out thinking about what uniform I will be wearing tomorrow when I know I can make an impact tonight. Bobby Evans is extremely good with us about informing us. He called me last offseason to tell me I was safe when Stanton Rumors were flowing. He asked that I keep it quiet. He did not want other teams to know the Giants were not going to deal me. He wanted those rumors to flow to raise the cost of acquiring Stanton for other teams if the Giants were not going to get him. I appreciated that. It took a lot of stress out of my life. TWG: Who was your favorite ballplayer and What was your favorite team growing up? CS: Steven Duggar and I were recently talking about this. I loved Manny Ramirez growing up. We both did and agreed he was a sensational player. I also loved David Ortiz. I was in fifth grade when the Red Sox won in 2004. I grew up with them and they were my team. During games in the backyard I would emulate them. I would put a mirror next to the TV to see what it looks like if Manny Ramirez were hitting as a lefty. I wanted tho hit him like him. He was something to watch. He and Ortiz both had the clutch gene in them and they made a tremendous impact on me. TWG: What current Major League player most inspires you? CS: I really like watching Paul Goldschmidt and how he goes about his business. I appreciate how even-keeled he is. He had a pretty rough start to the season this year and you still watch him to go the plate and he looks the same as he does when he is on fire. Watching him I knew he was going to break out of his slump then sure enough he starts raking and ends up being the June Player of the Month in the National League. I love seeing players turn it on like that. It’s inspiring to see the best ballpayers in the world go through slumps and get out of it. It means a lot to me. I also love watching Freddie Freeman. He is as good as anyone in the league. He is a great player, a complete player with slugging, on base percentage, and fielding. He is very impressive. TWG: If you were a Major League scout how would a scouting report on you go? CS: I probably say, looks relaxed, in the box, good feel for hitting, works very hard, good teammate, picks his players up. TWG: What baseball achievement are you most proud of in your career so far? CS: Just getting drafted, having an opportunity to start my career with the Giants. I hope its the start of many great memories with the Giants. TWG: What is your impression of the Giants organization, from San Jose and Richmond to Sacramento to San Francisco? CS: I love the Giants. It’s a second family to me. Being in the organization for three years the coaching staff, the executives, the teammates, they are all like brothers and a family. They have every imaginable resource and they want you to succeed. They want to help you, and want you to get better. The organization as a whole will help with all aspects of the game, from the weight room to the batters box, and on the field. They help me look at what I do really well and maximize so it is not a negative light. It’s essential to have positive reinforcement in a game with so much failure. Their philosophy is a great thing. A hitting coach will help me, for example, analyze what I do great and help me do it more so it outweighs the negatives or flaws in my game.. That changes the whole conversation and perspective. There is no secret that the Giants know how to develop guys. Being in their system makes me a complete player.